In fact, Hippolyte Pixii in 1832 built a practical magneto (above). It generated AC, but a rotating switch reversed connections each half-turn, creating a current which could charge batteries (image on right)/. Later generators replaced the permanent magnet with a rotating electromagnet (powered by the part of the current generated), turning in the field of another electromagnet, somewhat like the coil described earlier for the galvanometer. But there existed no wide need for electricity. The situation changed rapidly around 1880. First, Thomas Alva Edison introduced the electric lightbulb in 1879. Many independent inventors designed similar lamps, but Edison vigorously promoted his lamp commercially and built DC power stations for his customers. Edison's lamp used a spiral carbon filament, produced by charring a strip of bamboo, in a glass bulb from which all air had been pumped. The lamp which dominated the 20th century was introduced in 1902 by the Austrian Carl Auer von Welsbach, with a metal filament (nowadays made of tungsten, which can stand high temperature). Rather than vacuum, filament lamps now containe the inert gas argon, which forms close to 1% of the Earth's atmosphere. Electric motors also turned out to be extremely convenient for transportation. Urban trolleys ("streetcars") spread widely, replacing horse-drawn ones, cable cars like the ones preserved in San Francisco and elevated steam railroads. Most important, electric propulsion was the only feasible way for running underground urban railroads ("subways"). Many other uses also preferred electric power --elevators, cranes and so forth. Edison's network provided about 110 volts DC, which fit his lightbulbs and could be provided over short urban distances with no great loss. Nikola Tesla recognized the advantage of AC--in fact using several coils on the same dynamo to generate more efficient "polyphase" AC whose wave cycles were independent. The big advantage of AC was that transformers could convert electricity to high voltage (very efficiently!) and thus use much less copper in the distribution network. It was first developed in Europe, but George Westinghouse, who got wealthy by inventing an air brake for trains, brought the system to the US and hired Tesla to develop it. Electric lights could operate on either AC or DC, AC motors were at least as efficient as DC ones, and gradually AC prevailed. After a short but nasty public rivalry Westinghouse beat out Edison's "General Electric" in bids for the Niagara power station and for the lighting of the 1893 World's Columbian Exposition. In the end General Electric itself switched to AC, guided by Charles Proteus Steinmetz who also developed the theory of AC circuits. One wonders whether electric technology would have evolved as vigorously, were it not for the special properties of iron--properties known as ferromagnetism (the prefix "ferro-" signifies iron, though some ferromagnetic alloys contain none). Iron made possible permanent magnets and compass needles, and generous amounts of it in electric motors and transformers are used to increase and channel magnetic forces. The special magnetic features of the iron atom are due to the magnetism of electrons it contains. Actually, many other atoms are also magnetic, but their magnetic axes are usually randomly oriented-- a strong magnetic field will line them up somewhat and get somewhat reinforced ("paramagnetism"), but not by much. Ferromagnetic atoms spontaneously line up with each other, in chunks known as magnetic domains. In a strong field these domains line up magnetically and drastically reinforce the magnetic properties. In some materials--such as steel, hard elastic iron containing 0.5-1% dissolved carbon--they can stay lined up and create permanent magnetism. In material like soft bendable wrought iron (low carbon content) they slip back to disorder, as they also do in permanent magnets if heated past a characteristic temperature (Curie point). Lodestones are natural magnets rich in iron compounds, occasionally found in nature. They are believed to originate when a suitable mineral is struck by lightning, whose strong electric current, though very brief, creates a sufficient magnetizing force. Of course, any ferromagnetic concentration of magnetic field lines has a natural limit: when all magnetic domains are lined up, the iron becomes saturated by the magnetic field and can no longer add to it. 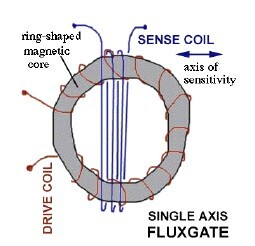 This is important in fluxgate magnetometers,, described at the end of this section. Have you ever opened an electrical transformer? (Presumably, one disconnected and discarded) If so, you may have noted several things (see image). First, the shape of the iron core: it is probably shaped like the letter H, with extra iron bars added across the top and the bottom, and coils that go around the central bar of the H (in the image, that bar is vertical). The "primary coil" wrapped around that bar receives AC and produces in the bar an alternating magnetic field, which is then picked up by the "secondary coil" also wrapped there (in the image the coils are stacked separately, but they can also be wound one on top of the other). In the operating range, the ratio V2/ V1 between output and input AC voltages is also the ratio N2/ N1between the numbers of windings in each coil: V2/ V1 = N2/ N1 The high efficiency of the transformer depends in part in confining all magnetic flux to the iron yoke. Past the peak of the AC cycle, the current I causing the magnetization weakens and reverses, but the curve lags behind. When it crosses the H axis on its way down, I=0 and B is zero too, but H still "remembers" the old polarity, and will not reverse until the reverse current is large enough. The process now repeats the same variation with the opposite polarity, tracing in every AC cycle a closed "hysteresis curve" along the arrows drawn. An energy loss is associated with this forced reversal and can be shown to be proportional to the area inside the curve; alloys used in such cores are selected to attain the smallest possible areas. The lost energy appears as heating. Large transformers serving the electrical grid need to be cooled, by enclosing them in tight containers (sometimes with cooling fins sticking out) filled with insulating oil. If a transformer in your home starts running hot, perhaps it needs replacing. If however an outside magnetic field exists at that location, with a component B1 in the direction of the rods, in one of them it will add to the magnetic flux in its direction, in the other, subtract from it. Therefore one rod will saturate a little ahead of the other in the AC cycle, and the other a little afterwards, creating an e.m.f. signal which can be detected. With suitable design, this signal provides a very sensitive measurement of the component B1. To detect all three components, of course, requires 3 pairs of rods in mutually perpendicular directions. The pair of rods can also be replaced by a ring core of ferrite (see below). Several people pursued this detection method in the 1930s, but the most successful was probably Victor Vacquier. Until then, measurements of the magnetic field of Earth relied on some sort of suspended magnetic bar or needle: the fluxgate instrument allowed measurements to be pursued aboard airplanes and ships, and later aboard spacecraft as well. Warships could detect iron submarines under water (one reason the Soviet Union switched to the metal titanium). Magnetic surveys could be carried out at sea, discovering conclusive evidence of plate tectonics and of the record of reversals of the north-south polarity of the Earth's magnetism dating back many millions of years. In space fluxgates have monitored the very weak magnetic field in interplanetary space and also surveyed magnetic fields of other planets. The sensitivity of such instruments extends to fields weaker than a millionth of the Earth's surface field. For another interesting story about the use of such an instrument, see "About Electronic Magnetometers and about Smoking."